Huh? Eva Jones? Father Smith, mother DeFrance. 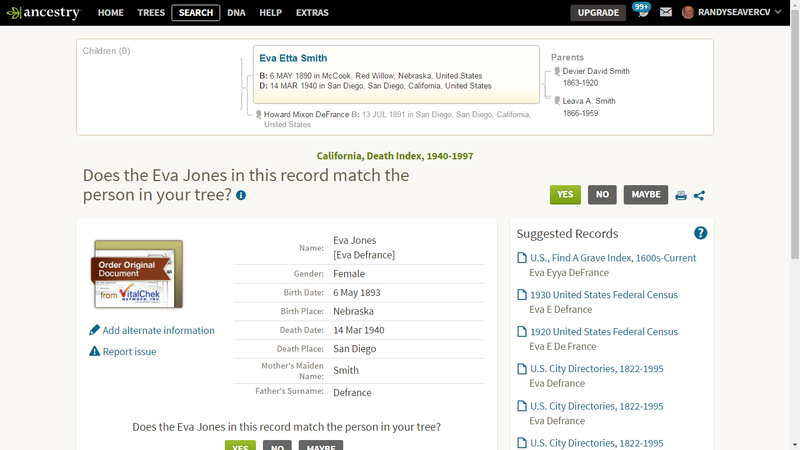 Yep, that's my first cousin, twice removed, Eva Etta Smith, the daughter of David Devier Smith (1863-1920) and Leava A. (Smith) (Smith) DeFrance (1866-1959) - wife of Joseph Walton DeFrance (1865-1937). Jones? Really? The last I heard she was the wife of Howard Mixon DeFrance (1891-1937, son of Joseph Walton DeFrance and his first wife, Margaret Leonah Mixon). Did Eva marry again? Apparently. The bodies of two suicide victims, Mrs. Eva Jones, 45 1645 Fifth Ave., and Miss Marjorie C. Hemphill, 41, 5645 Bellevue Ave., La Jolla, were found yesterday, A.E. Gallagher, deputy coroner, reported. Mrs. Jones, despondent over ill health, committed suicide by asphyxiation, Gallagher said, leading a hose from a gas outlet into her bed. He mother. Mrs. J.W. DeFrance, found the body, which was taken to the Bradley-Woolman mortuary. Miss Hemphill's body, dangling from a sheet, was found in her garage by her landlord, Gilbert E. Love, 4940 Lamont ave., Pacific Beach. Gallagher said she had been despondent over financial difficulties. The body was taken to Kerrigan's mortuary, La Jolla. 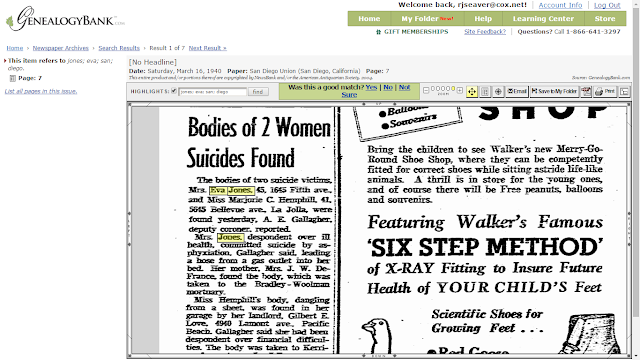 "Bodies of 2 Women Suicides Found," San Diego [Calif.] Union newspaper, digital image, GenealogyBank (http://www.genealogybank.com), 16 March 1940, page 7, Eva Jones entry. So now I know the cause of death for Eva. I note that she died on 14 March 1940 - I wonder if the death of her husband on 15 March 1937 contributed to her despondency? Now the new mystery is the name of Mr. Jones. I have no clue! She must have married him between 1937, when her first husband died, and 1940, when she died. JONES -- Eva. March 14, wife of A. Rex Jones, daughter of Mrs. Leava A. DeFrance. Services, Bradley-Woolman Chapel, Tuesday, March 19, 2 p.m., Rev. Jon N. Osborn officiating. Interment, Mt. Hope. So the husband's name is A. Rex Jones. I chased him down. I found that his name was Alonzo Rex Jones, born in 1894 in California. 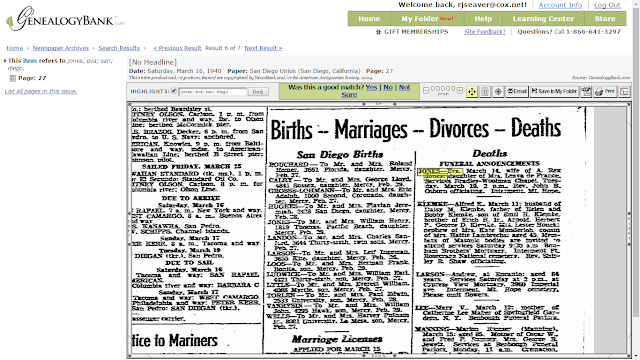 He has two other marriages in San Diego in the 1950s. 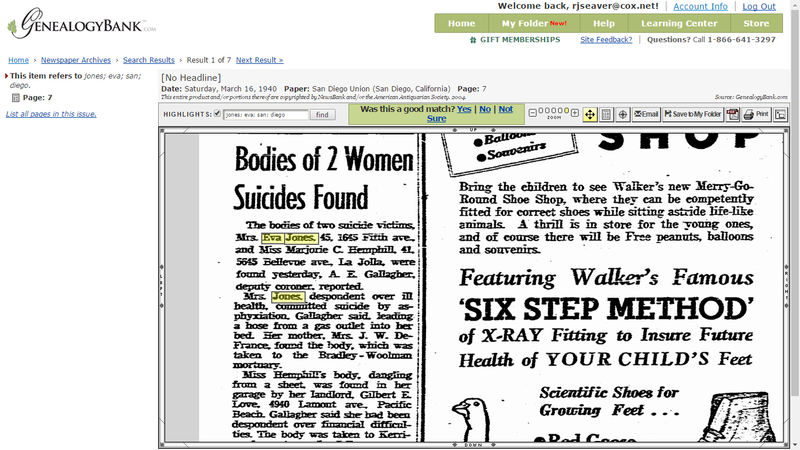 Even though this was genealogy fun, it's still very sad - I didn't know there was a suicide in the extended Smith family. I wonder if my grandparents, and my great-grandparents attended the service and the burial, since Eva was my great-grandmother's niece? I would guess that they did. Every little bit of evidence helps create the timeline of a person's life. Every time I find something like this, I realize that life is a lot more complicated than birth, marriage, death, census enumeration, etc. 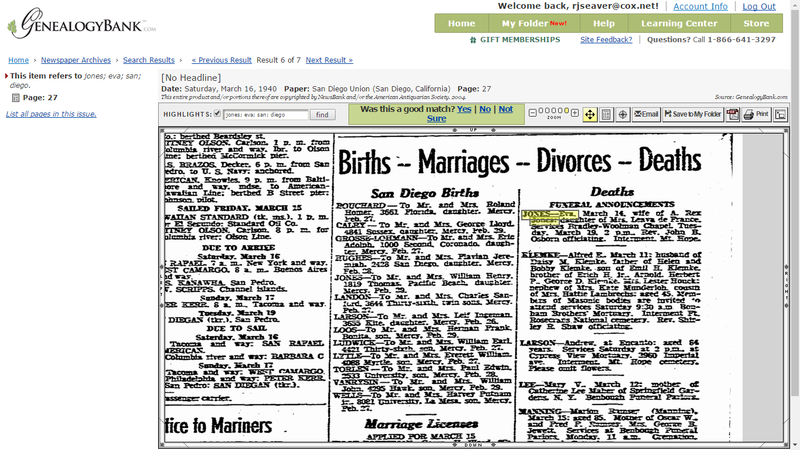 Records like this often create another challenge for a genealogy sleuth to ponder and follow up.